(WebDesk) Brand new Russian multipurpose Ka-62 transport helicopter conducted its first test flight, “Russian Helicopters” holding reported on Thursday. The aircraft performed circling at a speed of 110 km/h. The flight endured for 15 minutes. Kamov Ka-62 is a multipurpose transport helicopter designed on a basis of military Ka-60 model and intended to partially replace Mil Mi-8 helicopters which have been produced since 1965. Ka-62 is capable of carrying passengers, performing offshore operations, can be used as an aircraft for emergency medical aid, search and rescue operations, cargo transporting, etc. Thanks to significant service ceiling and thrust-to-weight ratio, the helicopter is also capable of conducting search and rescue missions in mountainous areas. 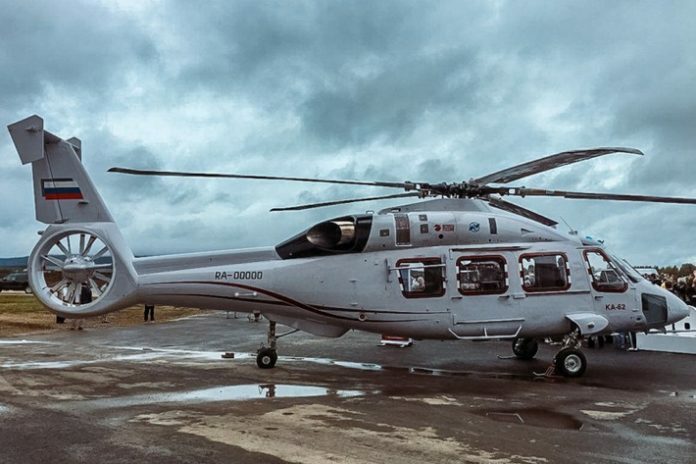 The new aircraft, however, received a portion of criticism from aviation experts who criticized the long period that passed from initial development of the helicopter in 1990 to its actual production. Besides, analytics chastised presence of a rather large amount of foreign-manufactured components, especially the French Turbomeca Ardiden 3G power plant.